iPhone Stun Gun Case — Protection or Trip to the ER Waiting to Happen? 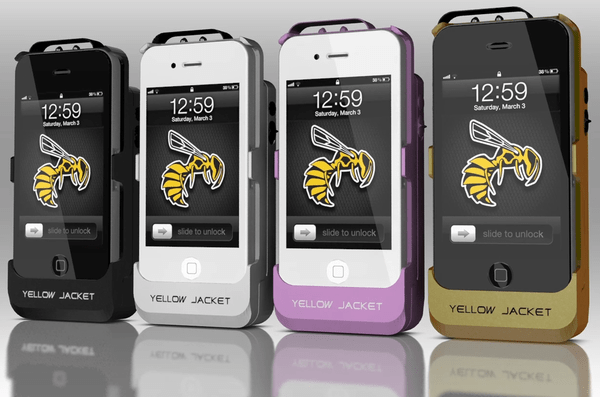 The Yellow Jacket iPhone Stun Gun case is exactly as its name implies. It’s a case for your iPhone that has a built in stun gun feature. With a 650K volt stun gun built in, this is not a case to be taken lightly by its user. Currently just an Indiegogo project, the Yellow Jacket has already made its minimum goal to start production. Imagine this for a minute….you get a call and go to answer it. Instead of pushing the incoming call button, you get the shock of your life and stun yourself. I guess the makers of this case anticipated that exact same scenario because in order to use the stun gun feature, you must bypass the safety switch and rotate an electrode cap. Yellow Jacket’s website claims this should only take about a second to complete. The shock is described as “incapacitating and capable of inflicting pain and injury” (I guess calling it a stun gun wasn’t enough to tell people that). Coupled with the iPhone, the total weight of the case and phone will be around eight ounces. The thickness will be comparable to the Otterbox Defender and Mophie Juice Pack at around one inch in thickness. The battery that supplies the stun gun its juice can also provide your iPhone with an additional twenty hours of battery life. I didn’t see anywhere on their page that said the screen would be fully protected from drops. It should be noted that before traveling with any kind of stun gun device, you should check the local laws to see if they are allowed. What do you think about this device? Do you see any potential safety issues or are you already wondering when you can get your hands on one? Let us know in the comments section.